Thai tapioca buns with minced pork, roasted peanuts and preserved turnip. Saku sai moo. .
11.Thai tapioca buns with minced pork, roasted peanuts and preserved turnip. Saku sai moo. 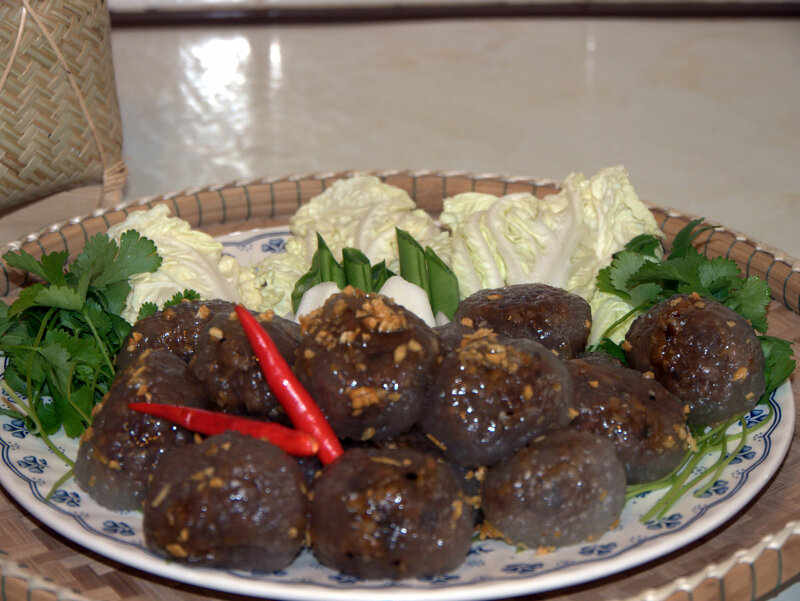 Thai tapioca buns with minced pork, roasted peanuts and preserved turnip. Saku sai moo. In Thailand these might be sold by a street vendor, or the local fresh food market. Fry the 2 crushed cloves of garlic in olive oil until it turns yellow -gentle heat. Keep half the oil to roll the filled balls of tapioca at the end. Move the fried garlic and half the oil to a separate bowl. Crush the pepper and coriander seed together with another two cloves of garlic in the mortar. Fry the pepper and coriander paste with half of the oil in the pan. 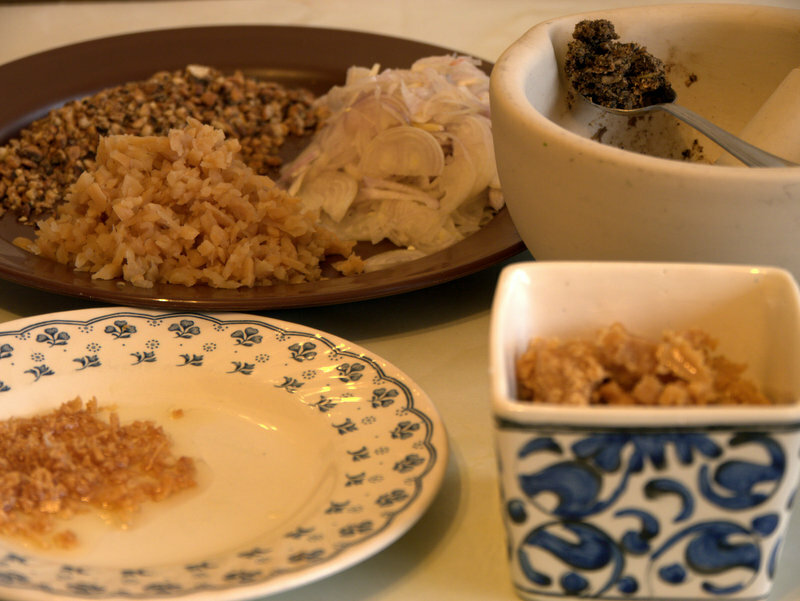 Add the shallots and fry till soft, Add the preserved turnip and fry till cooked, then add the minced pork and add the sugar, salt to taste. Fry unitl it is dry. Add the crushed peanuts to the pan and continue to fry over a gentle heat. It should stick into small balls. Now take the tapioca which should have absorbed the water. Knead it gently together, but not so much as to break up the balls. Take a lump in your hand and flatten it out into a circle, then put a lump of filling in the middle and fold the tapioca to completely cover it. 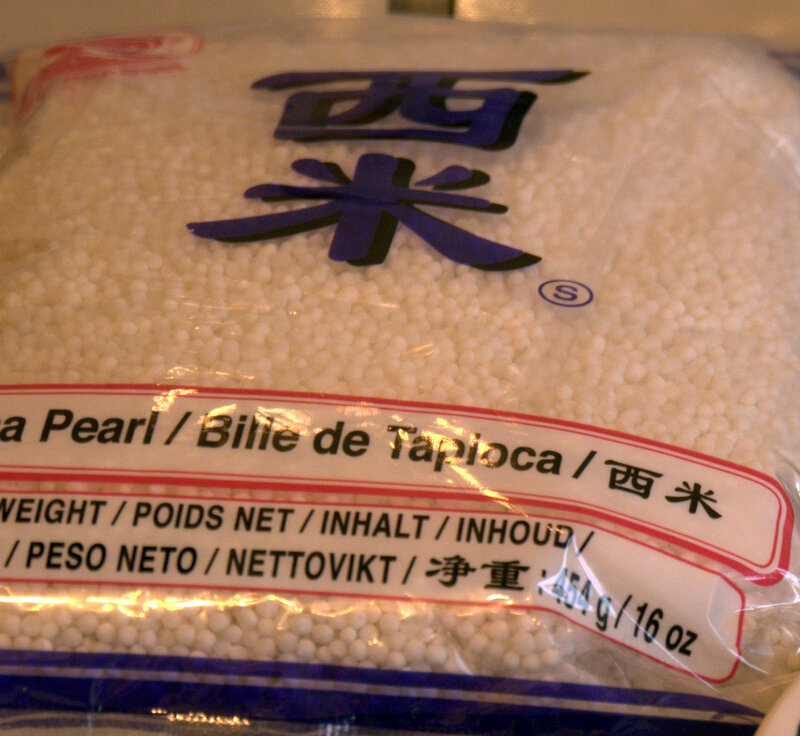 The edges of the tapioca should seal together into a ball. In the moratr the crushed pepper, seeds and garlic.